Caucus Leads Fight Against Green New Deal! Click HERE. Today, Congressional Western Caucus Chairman Paul A. Gosar D.D.S. (AZ-04), Chief Regulatory Reform Officer Andy Biggs (AZ-05), Western Caucus Member Tom Emmer (MN-06) and the American Exploration & Mining Association released statements after Members of the Western Caucus led an effort supported by 30 Members of Congress and endorsed by dozens of business representatives, elected officials and resource experts requesting that the final composition of the 'critical minerals' list include aggregates, copper, molybendum, gold, zinc, nickel, lead, silver and certain fertilizer compounds additional to the 35 originally put in the draft list. 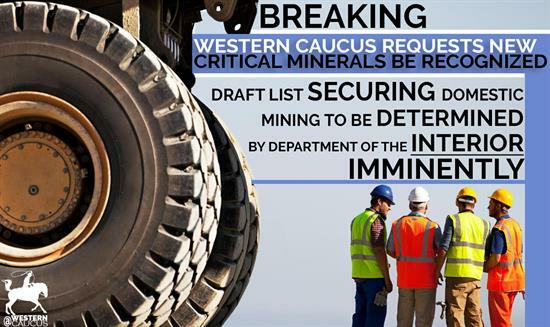 Chairman Paul Gosar stated, "President Trump and Secretary Zinke have done a great thing by opening up the critical mineral designation process and really listening to the input of experts, Congress, industry and members of the public in order to examine the economic and geopolitical ramifications of certain minerals being placed in or excluded from the 'critical minerals' list. This is a list of those minerals that have sensitive international supply chains but are of extreme importance to our economy and national security. The good news is that for so many of the minerals which may be designated 'critical', we enjoy substantial reserves at home. There is no need for the United States to be import-reliant on adversaries and foes for these valuable materials. Today, we ask that those who are making decisions about 'critical' status make sure that obviously-critical minerals like copper, gold, molybdenum, zinc and others make the final list. Given the incredible domestic need for these minerals, it's no exaggeration to say that the very security and stability of our country depend on the United States prioritizing permitting and development for our vast reserves right here in America." Chief Regulatory Reform Officer Andy Biggs said, “The Trump Administration is doing great work on critical minerals. Arizona is home to one of the largest reserves of copper in the world, and should be included in the Administration’s final list. Expanding the critical minerals list will enhance our national security, infrastructure, and economy. I urge Secretaries Zinke and Ross to strongly consider our constituents’ requests to include copper and other vital minerals." “The Administration's report proves what we have known for a while: the United States irresponsibly depends on foreign nations for critical minerals. We have the option to shift away from this alarming 100 percent reliance by optimizing our nation’s own deposits, the largest of which can be found in my home state of Minnesota. To this day, the largest copper-nickel deposit in the world in northern Minnesota remains untapped. The report illuminates the dangerous costs of continuing down this road, the most serious of which is the risk to our national security, which is why I urge action on my MINER Act to allow for environmentally-appropriate exploration of one of the world’s most valuable precious metal deposits,” said Congressman Emmer. “The Trump Administration is on the right track to recognize the importance of critical minerals in the American Economy. However, the time is ripe to complete the task and end our foreign dependence when we are ready to responsibly mine here at home. $9.2 Billion and 16,500 jobs are waiting to be unleashed benefiting rural economies,” stated the American Exploration & Mining Association. Today, 30 Members of Congress signed and sent a letter to relevant Administration officials including Secretaries Zinke and Ross as well as the White House Council on Environmental Quality Acting Chair Neumayr requesting that they consider the addition of other minerals to the 'critical minerals' list. Additional requested minerals include: aggregates, copper, molybendum, gold, zinc, nickel, lead, silver and certain fertilizer compounds. To see the full letter, including explanations for the possible inclusion of each of the above minerals, as well as Members' signatures click HERE. On December 20, 2017 President Trump issued Executive Order 13817, in which he directed the Secretary of the Interior in coordination with the Secretary of Defense and consultation with heads of other relevant agencies to determine and publish a list of critical minerals. Under the Executive Order, a 'critical mineral' is one which is identified to be a non-fuel mineral or mineral material essential to the economic and national security of the United States, the supply chain of which is vulnerable to disruption, and that serves an essential function in the manufacturing of a product, the absence of which would have significant consequences for the economy or for national security. An initial draft list was produced by the U.S. Geological Survey (USGS) within the Department of the Interior (DOI) in cooperation with the Bureau of Land Managmennt and published on February 16, 2018 seeking public comment on changes to the list. See the press release issued by the DOI upon the release of the initial draft list here. While 35 total materials which meet the definition of a 'critical mineral' were included in that initial list, many resource and foreign policy experts believe that several others, including copper, zinc, molybdenum, gold, silver, several fertilizer compounds and others should be considered as potential additions due to factors including the United States' net import reliance, trends in importation, the questionable or unfriendly diplomatic status of countries from which importation is significant or likely to grow, or other factors which could imperil the stability of supply chains of minerals which are of significant economic or national security importance to the country.